Keep your whole establishment sparkling clean with SC Johnson Fantastik® 308685 32 oz. all purpose spray cleaner with bleach! This powerful cleanser cuts through caked on food stains, grease, soil, soap scum, mildew, and mold to leave surfaces looking and smelling clean and fresh. Fantastik® may be applied to countertops, stovetops, sinks, appliances, tubs, showers, grout, tile, toilets, and other hard, nonporous surfaces around your commercial kitchen or restroom. It also works equally well on tile, fiberglass, and vinyl! This cleaner comes in an easy-to-use 32 oz. spray bottle that releases a thick line of cleaner to remove mold and mildew stains. Simply turn to spray nozzle to "ON," hold the bottle 6-8 inches from the surface you need to clean, and spray. Then you just need to wipe it down and rinse it off, and your surface will be shiny and clean! Its powerful formula also leaves behind a delightful, fresh scent that eliminates unpleasant bathroom odors. As you clean with this, you can rest at ease knowing that the bleach is killing any germs on the surfaces that you are cleaning. The scent is very clean and instantly reminds you how much cleaning you’re actually doing. Love this product! This product is really good, eliminates tough stains like wine, coffe, grease, ketchup and more. I like the trigger where you can turn in on or off. Who does not love this stuff? I mean, it says it all in the name! I have been using this stuff for years, and at this price it is a major score! Let it soak for a few on tough stains. This stuff will get it clean! This product is excellent to clean bathroom in general, take out stains immediately also kill bacteria and take out mold inside of the doors in the bathtubs etc. Classic bleach-based cleaner. The spray action is good and strong, and 32oz is a good amount. You can use it in the bathroom or the kitchen, wherever you need bleach to sterilize things. I love s rubbing bubbles and the fact this one has bleach in it is even better. I use it in the kitchen and bathroom to get rid of bacteria and it also makes everything smell clean. This is one great cleaner here for your money. Cleans all types of stains from spaghetti, fruit juice, salsa, mustard and more. Fantastic with scrubbing bubbles is great for cleaning anything. Can use in the kitchen, bathroom or anywhere else you can think of. Excellent cleaning product and good value too. Can be used in kitchen on counters, appliances and sinks- very effective at removing tough stains. Also works well in the bathroom - on counters, tub and shower stall. This all purpose spray is great for bathrooms and kitchens but I primarily use it in my shower. It cuts right through soap scum and requires minimal scrubbing. This fantastik spray cleaner is perfect for cleaning restaurants, kitchens or countertops. Heavy duty cleaning action makes it great for removing grease and soap scum. I love this product in my bathroom. It cuts through all of the mold and mildew and keeps my tiles looking brand new thanks to the added bleach! 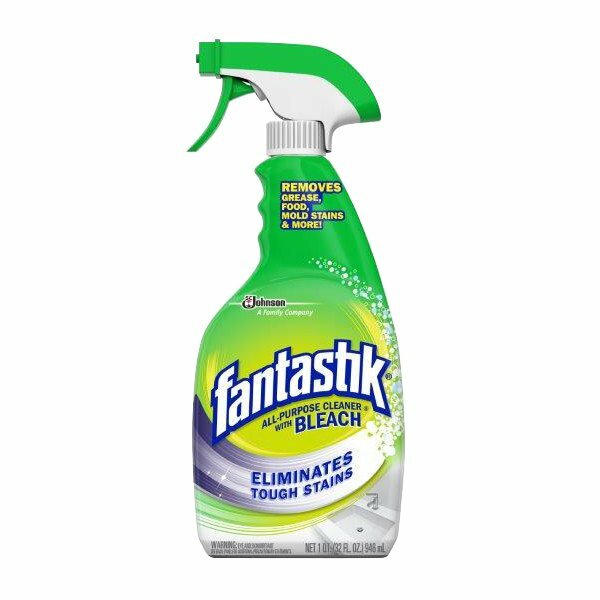 Fantastik all purpose spray cleaner with scrubbing bubbles is perfect for all surfaces from counter tops, tables, restrooms etc. Case of 8 bottles is a great value. I absolutely love this product! This 32 oz scrubbing all purpose bubbles is great for cleaning everything. I keep a bottle in kitchen and in the bathrooms works fantastic. this spray is very versatile. it has got all the power of an all purpose cleaner but with the disinfecting and mold crushing power of bleach! Sir Clean use Diversey Fantastik 32 oz. Scrubbing Bubbles All Purpose Spray Cleaner with Bleach, its perfect to use in bathrooms, the quality is really good. The result are amazing. I love the Scrubbing Bubbles line of products, though I had never purchased this particular kind (with bleach). I was very happy to find it especially with such a good price. It cleans very well and breaks down grime that other products failed to clean. This Fantastik Scrubbing bubble cleaner is great as a 5-in-1 cleaner. I mainly use this product in my bathroom, as it cleans my shower and countertops really well without leaving a greasy residue afterwards. I definitely recommend this great value from Webstaurant! This all purpose spray cleaner is awesome! It works every time to eat away at stains and grime. The bottle itself is a great design and is very functional. The product works great as intended. When I ordered two, one of them was busted and leaked all over the box. I had to throw it away. I ended up just buying them in store that way I know they won't be damaged. Great All-Purpose cleaner for toilets and bathtubs (and other equipment / utilities) that really cleans. The spray nozzle is extremely accurate and the trigger is easy to pull. It eats through a lot of dirt, grime and stains. We prefer it up there with some of the other top notch cleaning products. I am not sure why but this cleaner is difficult to find where I live so I was glad to see it on Webstaurant. I picked up two bottles and plan to get more in the future. Fast shipping and great service as always. Five stars all around. I have never seen a product work so quickly. I sprayed it into the toilet and waited about a minute and wow all I had to do was wipe and my toilet looked brand new. Fantastik with scrubbing bubbles cleans all sorts of surfaces very well. I especially like to clean the bathroom with it as it leaves a fresh scent and disinfects to boot. It leaves surfaces shiny and pristine. This product cleans like a charm. It is great for use in bathrooms or other areas which require sanitation. I personally like the smell it leaves behind too, I think it leaves the room smelling clean. This is a really heavy duty cleaning product. but it is still safe to use on gentle items. great for cleaning bathrooms and kitchens too.